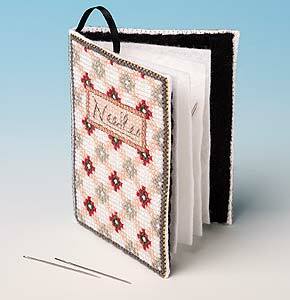 In a Victorian tile pattern to match the tray and base of the Sewing Box, the kits contain 14-count Aida, felt, plastic canvas, stranded cotton, needle, chart and full instructions. Worked in a Victorian tile pattern to match the Victorian Mansion Sewing Box, this needle case resembles a little book, complete with a ribbon "bookmark". The finished size is 8.6 cms high. Ribbon is included, but only one needle is supplied with this kit.